Many of you will be excited to hear that Voodoo Vaudeville have been rehearsing in the studios. 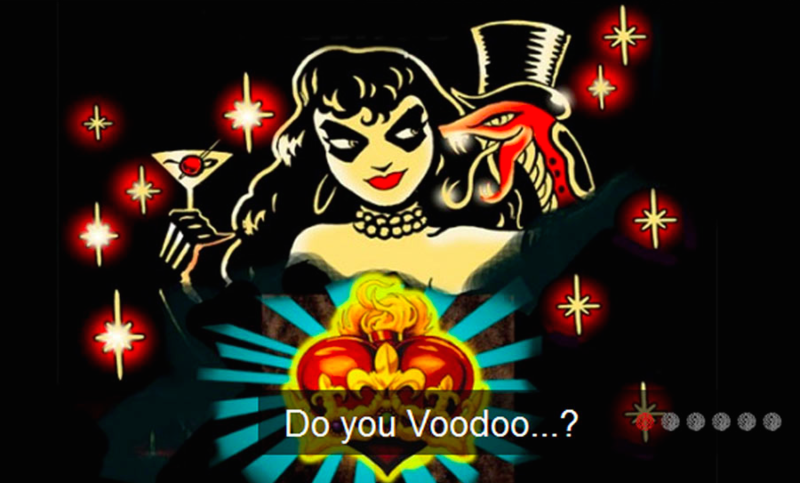 For those who don’t know, Voodoo Vaudeville is a themed theatre cabaret night with roots in circus, rebel rock music, vaudeville and original form burlesque. From its inception in 1999, it has been the brainchild of Chris Cresswell (with inspired interventions from the inimitable Ruth Glaser. Chris has taken it from its anarchic art comedy beginnings to a place where it can fulfil many roles. Voodoo Vaudeville has performed at a diverse number of events from festival circuit favourites Bestival, Glastonbury and Lost Vagueness to Burlesque shows and the Torture Garden, from the Assembly Rooms to middle scale venues such as Trinity Theatre Tonbridge, Colchester Arts Centre, Udderbelly, Famous Spiegeltent. Royal Exchange Manchester, whilst retaining its residency at Komedia in Brighton. We caught up with Chris to find out what they’ve been up to recently. Hey Chris, thanks for taking part in our blog! Can you tell us a little bit about what you’ve worked on recently at the Copperdollar Studios? Sure! We are currently working on a show called Voodoo Vaudeville “After the Cabaret”. We’re rehearsing dances for the show, as you can see from the pictures! Sounds exciting. So, how did you hear about the studios? I’ve known Kt for years. I heard about the studios as she was in the process of developing her ideas and doing it up. Kt had had a dream of having a space to use for her own theatre company and to rent out to other members of the creative community. Once she found this place, she knew it would be perfect. I like the location in Kemptown and the fact that its close to my house (!). I also really like the decor and the light in the space, the up-cycling is really inventive and gives a special feel to the place. It compares well with other studios possessing all the necessary conveniences, the essentials being tea and coffee facilities and a loo. Where does the name Voodoo Vaudeville come from? The name Voodoo Vaudeville comes from the description of a show I was in many years ago called ‘The Lennie and Morris Show’. We described it as Voodoo Vaudeville and Marina Kobler from the Komedia who was producing the show suggested we use that as a name to create a monthly cabaret show at Komedia back in 1999. It’s stuck since then. Where / when can we see the show?